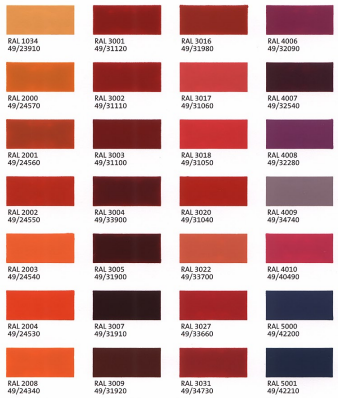 Which Powder Coat Awning Color Will You Choose?! You have the power to choose the awning color that is right for you! This is just a small sample of powder coat color options from TIGER Drylac we offer. Read on for the link to see the rest! If you have been following our blog, you are likely very well aware of all of the functional and wonderful benefits of residential and commercial awnings. By now, you know the importance of designing your commercial awning in a way that will enhance a clear message that increases curb appeal, draws customers in and boosts business! All of that aside, when you are designing your residential or commercial awning, how do you choose the right color?! Carroll Awning is here to give you an idea of what powder coat colors are available to you to ease the process. Let us tell you about some of the elements of our powder coatings. Our weather resistant Polyester TGIC Powder Coatings are intended for exterior and interior applications. These coatings feature good weather resistance, storage stability, high mechanical properties, a smooth flow and great coverage. Depending on what color you choose, your powder coating can appear smooth glossy or smooth matte textured. At Carroll Awning, we offer a wide range of powder coat colors brought to you by TIGER Drylac for our awning installations. If you want to view the full, extensive list of colors click here. Custom colors are also available! Are you looking for a bold, yet unique shade of red? Look to the color brochure and try color identifier “RAL 3018.” How about a regal and sophisticated purple? Try “RAL 4008.” There are also over 20 shades of blue! From canary yellows and robust shades of orange to teal hues of green and every neutral shade of black, gray, or brown you could want – you are sure to find the perfect color scheme for your awning installation when you choose Carroll Awning. We are experienced professionals who would be thrilled to help make your awning dreams a reality and help you stand out amongst your competitors. What are you waiting for? The Carroll Awning Company provides the best quality, energy-efficient canopies, awnings, and frames for any business, restaurant, home, or apartment. We design, create, and install custom-created canopies and awnings year-round! Check back to our blog every week for the latest and greatest news in the world of awnings. Need tips on how to clean your awning or advice on what awning design elements are more effective? We can help with that too.